The lovely Harry is a German Shorthaired Pointer Cross and although he looks every bit the Country Gentleman he certainly has a cheeky side. I met Harry's parents back in December when I was exhibiting the Moo's in Wareham with The Dorset Gallery they bought Harry in to meet me and he really is a handsome boy. Harry is a rescue dog and Stephen and his wife decided to take him in, although I believe he can be quite the handful (known in the past to eat a Passport just days before an overseas trip!) he's worth it! Stephen sent over a few photos for me to work from and we decided to go for the one with him sat on his chair with his legs crossed as this is a pose he regularly adopts and seemed to capture his character well. It was a nice change to include a background as often my pet portraits have very simple backgrounds or nothing at all so it's always great to do something a little different. 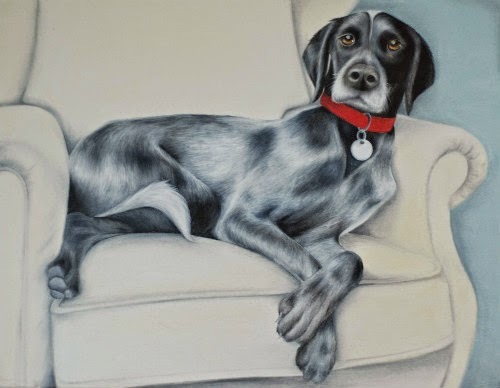 I dropped the painting off recently and was greeted by a very excited Harry, although I had sent a photo of the painting over by email it's never quite the same as seeing it in real life and both Stephen and his wife were very happy with how I had captured their Harry. After a cuppa and a slice of cake it was great to hear some of Harry's stories before heading back to the paintbrush!